Since late 1950s Russia has assisted India's growing heavy industry. Nikolai Goldin who was chief engineer at the Bhilai steel plant gives a fascinating account of those times. The USSR recognised India even before the country became independent from the British rule. This step helped India to consolidate its role as a new influential power, in a world gripped by the Cold War.Subsequently, in the late 1950s, the USSR began to provide assistance to India in laying the foundations of its heavy industry. 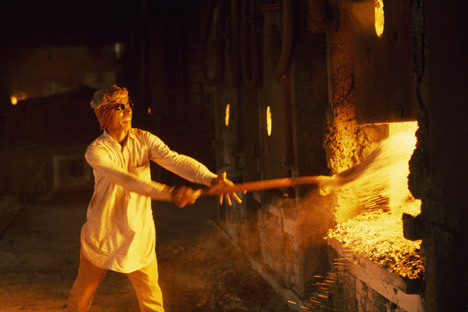 From that time until the mid-1980s, around 70 industrial plants in the Indian economy’s basic industrial sectors were built with Soviet assistance.Over time, they provided around 40% of India’s iron and steel, almost 80% of the steel-making equipment, more than 40% of the equipment for the mining industries and 55% of the heavy power-industry equipment, 10% of the electricity, and a significant share of the country’s petroleum products, coal, pharmaceuticals, and other products. Below we report on relations between Indians and Russians at these plants while they were under construction.Unfortunately, not all of the participants in these events are still alive.Nikolai Vasilyevich Goldin, who was chief engineer at the Bhilai steel plant and later served as the Soviet Minister of Heavy Industrial Plant Construction, died in 2001. It all began in a rural area of Madhya Pradesh, one of India’s economically backward states, in 1956. Former Soviet Minister of Heavy Industrial Plant Construction Nikolai Goldin told us in an interview how it happened. In 1958 he had been the construction supervisor and chief engineer at the Bhilai Steel Plant. Under the bilateral government-to-government agreement, the Soviet side was to do all the design work and produce all equipment, structural steel, refractory materials, and pipes. We would supply all of this to India, install it, and hand the project over to the Indians on a turnkey basis. We had never done this scale of project abroad before. It’s obvious that this was no light burden for the Soviet economy.At what level was the decision made to go ahead with construction? Senior officials from both countries were watching the construction site.They visited it.Did this have an impact on the work? “Khrushchov was supposed to visit the factory on February 10, 1960. A few days before that date, the workers went on strike. The action lasted three days. The strike organizers knew the plant’s vulnerable points. First they wanted to shut down the combined heat and power plant. That would have been a catastrophe. The blast-furnace process would have come to a halt. We would have had to dismantle the blast furnaces and start building the factory all over again. And did the strike end? Did Khrushchov’s visit go smoothly? “He inspected the factory in detail. The Indian engineers were greatly impressed that he understood technology. He asked what the ash content of the coking coal was; and what was the quality of the iron ore.
“Once Minister Swaran Singh arrived at the construction site,” Goldin continued. “He reported that in October the leadership of the ruling Indian National Congress party would be meeting in the city of Raipur, not far from Bhilai. “‘What can we show Prime Minister Nehru?’ he asked me. “We conferred on the matter and decided that we could launch the rail mill, the shop that would make railroad tracks. This meant completing this part of the plant six months ahead of schedule. Upon hearing our proposal, Swaran Singh said it was impossible. “I replied that I would take full responsibility. But we would need to get everything in order and inform all the workers, engineers, and technicians that we had to finish the rail mill before Nehru’s visit. I said this would inspire the Soviet and Indian personnel to show real enthusiasm in their work. The minister changed his mind and gave his approval. Not everyone, however, was happy with this burst of effort. Three days before the mill was to be launched, Goldin recalled, there was sabotage. The electric power supply cable was cut. And someone poured sand in the bearings of one of the milling units. “We discovered in time what these angry people were up to. If they had succeeded in their intentions, it would have discredited the Soviet Union in the eyes of the Indians and the entire world: because foreign reporters were coming to the plant on the eve of Nehru’s visit. But nothing came of these intrigues. Nehru was very pleased with our work,” said Goldin. But who was behind the sabotage?Was it the strikers? How were our specialists paid? Construction of the Visakhapatnam steel plant began in 1981, and the Soviet engineers and technicians didn’t have any grounds for complaining about their living conditions there. Vladimir Khrustalyov headed up the team from the Soviet Tyazhpromexport [Heavy Industrial Export] Association, which was responsible for implementation of the inter-governmental agreement on building this plant. He worked at the construction site from 1981 to 1987. Unlike at Bhilai, where our people arrived at the still-empty site and at first had to make do without running water and other conveniences, at Visakhapatnam the Indians built a residential town for the personnel. We had a cultural center for 400 people, with air-conditioning, and our own cafeteria, kindergarten, and clinic. The basic difference between the construction site in Visakhapatnam and the one in Bhilai was that by then the Indians, with Soviet assistance, had created their own basic industry, which could supply machine-tools and heavy industrial construction materials. Khrustalyov gives the following data: at Bhilai, approximately 95% of the equipment and 85% of the structural steel and materials came from the USSR. At Visakhapatnam we supplied only 17% of the equipment and 5-7% of certain refractory materials that were in short supply, and some of the metal structures. Everything else was made in India. “But was that approach justified from the standpoint of our national interest? After all, didn’t it turn out that we were blocking our own export potential?” we asked Khrustalyov. He replied that no other approach had been possible. The time you spent in India partially overlapped with the perestroika period.What impact did it have on you? At the same time, Khrustalyov says, perestroika brought a lot of good things, too. The previous tough barriers against contact between our personnel and the Indians essentially disappeared. People started visiting each other. The construction supervisor was the guest of various Indians and, in turn, he invited the port director and the chief of police to his home. We also exchanged movies with the Indians and taught them the Russian language. These ties continue to “work” for the benefit of Russian-Indian economic relations.